You are currently browsing the SparksElectric.com blog archives for December, 2011. The advancements in technology are not going away any time soon. In fact, we’re likely to see more technological breakthroughs in the coming months and years. It was only within the last 10 years before the Internet really took off throughout households across Milwaukee, the United States, and the world. It’s only been within the last 10 years that cellular phones have been seen everywhere, and only within the last 5 years that cellular phones have had mobile Internet, access capabilities. Some phones are now coming out with 3-D with no need for 3-D glasses required. It has only been about that long since Facebook and Twitter came onto the scene. Over the last year, the Internet has even made it onto regular television with “Google TV”. Many now subscribe to other internet TV companies. The point is that technology will continue to advance. The question is, “Are you ready?” Perhaps the better question is, “Is your home ready?” Let’s face it, older homes were not made to handle such advanced electronic equipment because there are too many devices, and each of them draws considerable power from your home’s electrical system. Does your house have the following items drawing power? Is it any wonder there are more and more electrical fires each year? It’s not all caused by homeowners or handyman services. The old wiring in many homes can’t handle too many electrical loads on so few electrical circuits with such poor, if any, grounding. Just as critical as the wiring, there is a component within the wiring system that is often overlooked. Grounding conductors and grounding systems are often misunderstood, overlooked and/or disregarded as not important. This is dangerous. This is one reason to have a certified Milwaukee electrician check out the wiring in your home if it is over 25 years old. Poor and outdated wiring can hold you back. Technological advances have enabled us to stay in touch with the world at all times, and get instant answers to almost any possible question. That is, until your computer goes down. Take a look at that mess of wiring behind or under your desk. You know, that place nobody really wants to look too closely at, what’s yours look like? Without updated wiring in your older house, you risk blowing fuses and a possible house fire that could destroy everything you own. Even if the blown fuses don’t cause a fire, what information would you lose if your computer goes down, or heaven forbid, a power surge fries the mother-board? Old wiring can create huge problems for today’s computer lifestyle. Did you know that many banks and insurance companies may not provide loans or write policies for homes that still use fuse boxes? This means that your home could be unprotected and uncovered in the event of an electrical fire. Did you know that you can’t add electric capacity or make additions to your home without upgrading to a circuit breaker panel? Banks and insurance companies know that houses with fuse boxes are three times more likely to be destroyed in a house fire than houses that have circuit breakers in them. Therefore, rewiring your older home is a must if you want to take advantage of all the technological advancements and devices available to you. Additionally, acquiring a competitive loan and quality insurance policy is virtually impossible without having a qualified and experienced Milwaukee electrical contractor and master electrician upgrade your home’s wiring. Now, how do you get the best deal when upgrading your wiring? You need to do proper research via your family, friends, and co-workers on which electricians in the Milwaukee area they were happy with in terms of their work performance and professionalism. You should also check online sites to see which electricians have favorable reviews and which don’t. You can also use online sites to post your electrical project and have electrical contractors in the Milwaukee area bid on it. You get to choose which contractor you want to have work for you, based on price and on reputation/references. Older homes may require more updating, thus costing more to rewire. To get a fair estimate, you should know how many rooms you want redone (whether it would be the whole house or just a few rooms). You should also know whether the electrician will need to get inside or behind your home’s walls to complete the rewiring or if it can all be done from an unfinished attic or basement. By knowing approximately how much money it will cost upfront and how much work will need to be done to update your home’s wiring, you will be better prepared to find the right electrical contractor in the Milwaukee area to complete the project correctly. By proceeding with the updating, you will be better able to utilize today’s technology to make life easier in your career and personal life, and most importantly, keep yourself and your family safe from the risk of an electrical fire. In our fast-paced world of today, we want to use the latest gadgets to make our lives easier and more enjoyable. This means that we are using refrigerators that can refrigerate and freeze food, while also dispensing drinking water and displaying recipes on an LCD screen. It also means that we are accessing the Internet and watching “On Demand™” movies on our large high-definition LCD or LED screen. These electronics are certainly wonderful items to have, as they make us feel like we are in a movie theater, yet we can go to our kitchen and quickly get a cold beverage to quench our thirst whenever we choose without missing any of the movie (as we can pause the movie) and without disturbing anyone. However, there is a downside to these technological gadgets, and that is the energy they use. While many products are more energy-efficient than their counterparts from decades past, they still draw considerable power, and if you are not careful, they can cause electrical fires inside of your home. Many mistakes that people make is that they use extension cords to power electronic devices such as televisions, DVD™ or Blu-Ray™ players, subwoofers, desktop computers, etc. The problem with this is that many extension cords are not designed to handle the type of power and the continuous loads that these items require. Plugging them into power strips via extension cords is just increasing the odds that your home will experience an electrical fire that can cause significant damage and even death to you and/or your loved ones. Therefore, electricians everywhere, including those in the Milwaukee area, will strongly advise you to plug any high-powered electronic devices into your power strips directly. These items need a great deal of power that can only safely be channeled through the item’s own power cord, not through a small gauge extension cord. Another major mistake homeowners make is plugging too many electronics into one electrical outlet. This is especially true if they have multiple power strips plugged into a single outlet. Most electrical contractors, including those here in Milwaukee, will advise you to limit yourself to one power strip per outlet to minimize the chances that your wiring causes an electrical fire. It is important to keep in mind that if you have a power strip connected to many or all of the electrical outlets in your home, you could be increasing the amount of electrical loads by 5-6 times what the wiring in the house was originally designed for. You simply need more 120-volt circuits and more dedicated 120-volt receptacles where you are using the power strips. 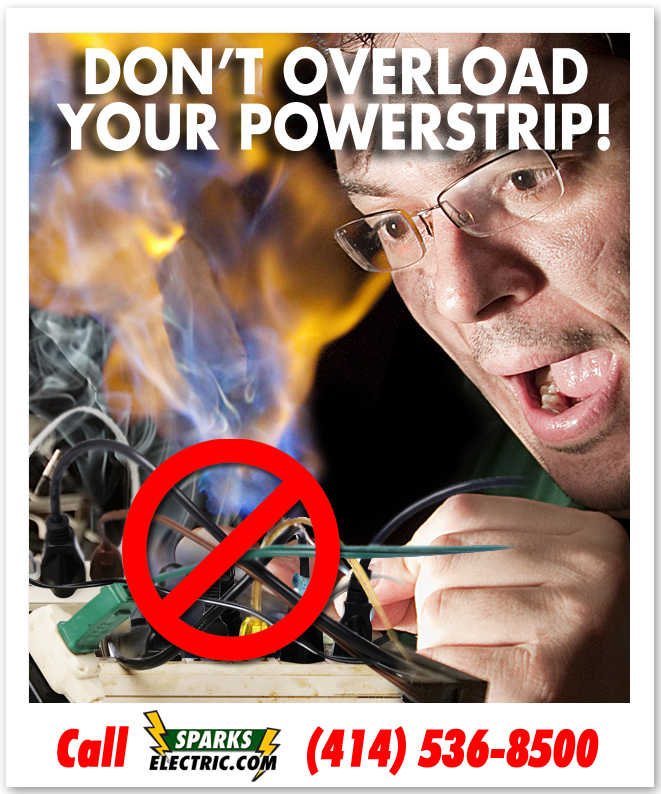 Plugging one or more power strips into a duplex receptacle does not mean it will be safe. In fact, the opposite is true. This actually creates an unsafe condition. Why take the risk? Have a qualified electrician correct or upgrade your substandard wiring. Having all your outlets available via the power strips does NOT mean that you can use all of those outlets at the same time, especially for devices that use a great deal of power. Using them all at the same time will make it much more likely that your house’s wiring or electrical circuits will overload, leading to fuses burning out and higher chances of a fire occurring. It is important to be more aware of all your new electronic devices, electrical appliances, and any other electrical loads in your home or business. While today’s appliances and electronics are made to use less energy than their older counterparts, you still have to take precautions not to plug too many loads into the same electrical outlets and/or using too many at any one time. You can’t reverse the damage from a house fire…or the possible loss or injury to you or your loved ones. Common sense will go a long way here. Please call an electrical contractor and schedule a service call to make sure your home is safe for you and your family.